Marriage Counseling Chicago: Is Your Relationship Too Close? 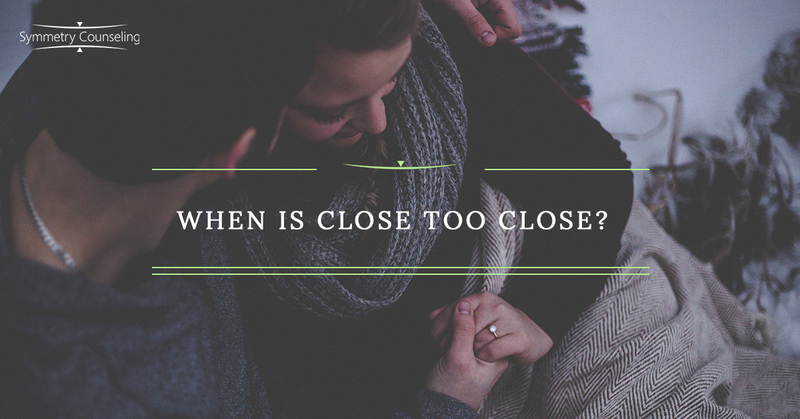 When is “Close” Too Close? While I do not necessarily disagree with that, during relationship or marriage counseling, I often see that message being misunderstood. We have developed romantic phrases and sayings such as, “You complete me,” “I need you,” and “You are my other half.” Our culture praises couples who do everything together and know each other so well that they can even finish each other’s sentences. As a couples’ therapist, my perspective is a bit different. This portrayal of love is unrealistic and even unhealthy. What many people may view as romantic love and something to strive for, I often see play out during relationship and marriage counseling sessions as codependence or as enmeshment. Relationships are most successful when two people are whole on their own and give each other plenty of space in the relationship for individuality, unique interests, and outside friendships. I often see couples in therapy who discuss, even boast, that that they are so close that they can anticipate what the other is thinking and feeling. Closeness is seen as something to strive for; as if the closer you are, the less likely you are to be unhappy to want to leave the relationship. While being close and intimate with your partner is healthy for any relationship, there is a fine line between close and too close. When couples strive for a type of closeness that is unhealthy, they end up relying on each other to cope with every-day stressors and can end up feeling stifled by the lack of independence and freedom. This can play out in a variety of different ways, and can often lead couples to seek out relationship or marriage counseling because they do not know how to correct the problem themselves. A common issue I see with couples the I work with who are “too close” or enmeshed is that they each feel that they have to “fix” each other’s emotions, or that their emotions can appear contagious. This will play out in fights when both partners escalate together or when one partner is sad and the other feels solely responsible for making them feel better. While it is a partner’s job to provide support and comfort in a relationship, it is never your responsibility to make your partner feel a certain way. Another common issue I see come up regularly during marriage counseling is, when couples are enmeshed or codependent, they do not have a life or a support system outside of each other. They rely on each other to meet all of their individual needs, which puts a lot of pressure on one person and the relationship. One person cannot be your everything. While your partner is often your top priority, that does not mean that you no longer prioritize other important relationships, such as those with your friends and family. It also does not mean that other activities and hobbies that fulfill you should be shelved because your partner does not enjoy them. It is vital for your relationship success that you each have outside friends and interests. If you are worried that you and your partner are enmeshed or codependent, it will be important to consult with a couples therapist or a marriage and family therapist to discuss how to improve your relationship and increase your independence. Contact Symmetry Counseling today to schedule a relationship or marriage counseling session.